Nearly half of the population that experiences homelessness in a year in Los Angeles County is homeless for less than a month, and investing in early intervention services would significantly reduce the number of people who become chronically homeless, according to a report released Wednesday. The Economic Roundtable, a Los Angeles-based think tank, combined 26 data sources for the report to help officials target those most likely to become chronically homeless. “Our analysis shows that intervening early with the right help will dramatically reduce the number of people that we see on the streets,” Dan Flaming, president of the Economic Roundtable, said at a news conference outside the Kenneth Hahn Hall of Administration. The report concluded that just a 10 percent increase in the rate of people who find early exits from homelessness could reduce the number of people who become chronically homeless by almost half. “If we can address people’s needs early and quickly, we can actually avoid a number of the negative consequences for people that remain homeless—job loss, involvement with the criminal justice system, stress that exacerbates mental health problems, disconnection from others, a loss of a sense of self worth,” Los Angeles County Supervisor Sheila Kuehl said. The report, “Escape Routes: Meta-Analysis of Homelessness in L.A.,” also studied the factors that cause homelessness in the county or impact a person’s ability to lift themselves out of homelessness. 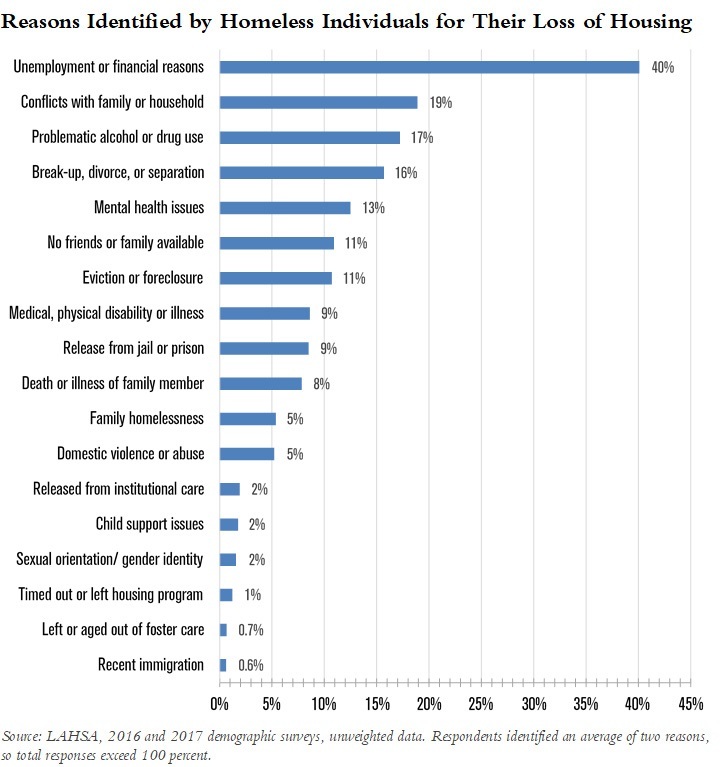 According to the report, the most frequently given reason for homelessness is unemployment and lack of money, which was cited by 40 percent of homeless people, while 19 percent said it was due to conflicts with family or household, 17 percent said alcohol and drug abuse and 13 percent said mental health. The Economic Roundtable, a nonprofit urban research organization based in Los Angeles, said it is developing two screening tools to identify homeless residents at risk of chronic homelessness using statistical models applied to linked client records. One screening tool is for foster youth and the other is for employable adults.